Sleep Number gets its name thanks to an actual “number” you find after you purchase a bed. This number identifies how firm or soft you want your bed to feel and can be adjusted with the click of a button or a tap on your phone. Your Sleep Number setting will be a number between 1-100; the higher the number, the more firm the mattress. 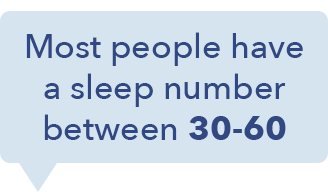 Most people have a sleep number between 30 and 60. In this article, we’ll dive into all the ins and outs of your Sleep Number “number” (also known as your “setting”) so you can understand what range might work best for you based on your sleep style and preference. Without further ado! How Do You Find Your Sleep Number Setting? 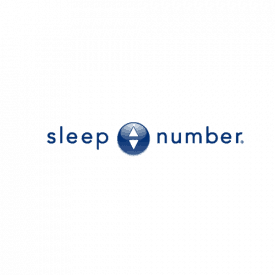 You can find your sleep number at a Sleep Number retail store. Their beds are displayed in their showroom, and a customer service rep can help you out. If you’re ordering your bed online and having it shipped to your house, no problem. You can easily find your sleep setting at home as well. There’s a good chance you’ll want to update your setting eventually in the future (more on that below), so knowing how to do it yourself is key. No matter where you do it, remember you can always adjust your sleep number, so it is never a permanent setting. Lie down. Get into bed (bring your Sleep Number remote or SleepIQ app!) and lie down on your side. Make sure your pillows are propped as they would if you were actually sleeping. Pay attention to how the bed feels. Sleep Number recommends bringing your setting up to 100 to understand what that feels like. Then, as the number goes down you’ll feel the bed get more and softer. Pay attention to how your body feels and reacts as the air chamber deflates. Choose a setting and stick with it for a few days. The moment your body feels like it hit that sweet spot, press Enter or Stop on your remote or app. The setting will automatically save so you don’t need to adjust anything. From there, try it out for a few days. If you’re finding that after a few days something still doesn’t feel totally right, you can try adjusting your number 5 or 10 notches. 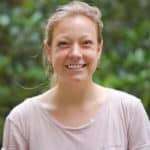 Now that you understand how to find your sleep setting, the next important question is “what number is best for me?” While every setting is very personal, and it’s up to you and your body to figure out what works, there are certain guidelines that can point you towards a number range depending on your sleep position and if you experience any aches and pains. Furthermore, we’ll explain how to adjust your sleep number setting if something doesn’t feel quite right. Stomach sleeping gets a bad rap, typically because too much pressure on your abdomen can flatten the spine’s natural curve and cause lower back pain. While any medical issues should be dealt with your doctor, the fact Sleep Number beds adjust to different firmness levels might help provide some relief. In general, stomach sleepers need a specific medium-firmness comfort to sleep well — firm enough so the spine stays properly aligned, while soft enough to reduce pressure on the tummy and ribs. A Sleep Number rep explain to me there are some guidelines to stomach sleepers find ease. He said: “I would suggest a higher Sleep Number setting to avoid sinking in too much on your stomach or face.” Since a person’s sleep number setting falls into a range between 30-60, try your setting around 50, see how that feels, and then increase or decrease it until you feel your body is properly supported by the mattress. As for what Sleep Number model might be a match, you could find a sweet spot with the p5 or p6 models, since those beds offer medium-firm comfort. These include four and five inches of comfort foam support, respectively, in comparison to no extra foam added on top of the c2, and seven inches above the i10. If you tend to sleep on your side, you’re not alone. About 74% of the population considers themselves side-sleepers. I want to reiterate that it’s impossible to spit out a single number that is best for all side sleepers. However, if you know you like harder beds — many side sleepers need the extra support — there’s a good chance your setting will fall in the 50-60 number range. If you know you like a little bit more softness, your number might be closer to 40. Models that also might be a fit include the c2 and c4 models, which is the Sleep Number “Classic” series and is an affordable, non-smart bed option. The c2 model has no foam above the air chamber, so this will feel really thick. The c4 has 1.5 inches of added comfort foam to provide a bit more support. If you know you want something with a bit more comfort and softness, the p5 bed might also be good. It’s also the most popular Sleep Number bed, thanks to an all-around balance of support to accommodate all sleep styles. In general, if you like squishy and soft beds that still provide solid and firm support, you could always try a combination of a higher sleep number setting with a thicker comfort layer. Back sleepers, you’re in luck! Back sleepers have the flexibility when it comes to mattress feel since the pressure is more evenly spread across your body as you sleep. Because of this, you really need to know and understand your body to find the best sleep setting. Typically, if you sleep on your back, the mattress should “fill in” the small of your back, so pay attention to this, and see how your body responds to it. As far as the different Sleep Number models go, many reviewers of the softer beds —the i7 and i8 — said it worked wonders for their back-sleeping style. These beds have five to six inches of comfort foam above the air chamber, giving a nice plush and soft feel to the bed. If you combine this with a slightly higher setting — around 50 — you’ll get a medium-firm feel. Back pain is a big issue when it comes to our sleep. It’s also incredibly common, with more than 80 percent of Americans suffering from back pain at some point in their lives. Luckily, the Sleep Number bed is designed to help alleviate some of this pain, while providing contoured and pressurized support to your body, especially the back. There is, unfortunately, a no one-setting-fits all for people with back pain. Yet, there are some good guidelines and tips to help with the ache, depending on your sleep position. Let’s dive in. For side sleepers: Drawing your knees slightly up towards your chest, like you’re entering a fetal position, is a good way to help alleviate pain. Try placing a pillow between your knees to reduce stress on your hips and back as well.If you’re still in discomfort, Sleep Number recommends increasing your sleep setting 5-10 points. For back sleepers: Try putting a pillow under your knees or a small, soft pillow under your low back. If you’re still in discomfort, Sleep Number recommends increasing your sleep setting 5-10 points. If you sleep on your stomach: A soft pillow under your pelvis or lower abdomen could relieve some stomach pressure and release tension in your back. If you’re still in discomfort, Sleep Number recommends decreasing your sleep setting 5-10 points. You probably won’t have only one Sleep Number setting for your entire life. There are a lot of external variables that can affect the firmness level of your bed. Plus, if your body changes, you should change your setting, too. If you realize you’re sleeping in a new position, you might want to try updating your setting to better accommodate your body. For example, if you go from sleeping on your back to sleeping on your side, you generally might be more comfortable increasing your setting. If you go from sleeping on your side to sleeping on your back, you might want to decrease your setting. You start sharing your bed with children and/or pets. If any new additions decide to curl up with you (whether a kid or your pup), you should update your sleep setting. To support the extra weight, you actually want to lower your setting by five or ten to make the bed a little softer so everyone feels comfortable. If you lose or gain weight. If you gain a good amount of weight (10 pounds or more), try increasing your setting in increments of five until it feels good. If you lose weight, consider lowering your setting in the same manner. These increments will vary depending on how much weight is gained or lost, so play around with it until your body feels good. You experience a temperature or altitude change. If the air temperature in your bedroom drastically changes the air volume in your mattress can be affected. If the temperature is getting warmer, consider increasing your setting to match the decrease in air volume in your mattress. Similarly, significant changes in weather, climate, or altitude may affect the air volume in your mattress as well. If you’re feeling achy from a killer workout, try lowering your setting by 5 to 10 points to make your bed feel softer, better cradling a sensitive and sore body. You’re injured, sick, or have had surgery. In this case, it’s best you consult your doctor to talk through what pressure points or sensitivities your body may be experiencing, and how a softer or more firm mattress might help you get better recovery and rest. There will never be a single “right” number for a certain type of sleeper. The best thing you can do is be in tune with your body, and know you can always adjust your Sleep Number setting to find something that works for your body. This, coupled with the different comfort layer options, means you should have good luck finding a level of comfort that best supports your sleep.